Video of the Telegraph Quartet in a fantastic performance of one of my favorite pieces by Anton Webern. The National’s new album, Sleep Well Beast, is out September 8th. 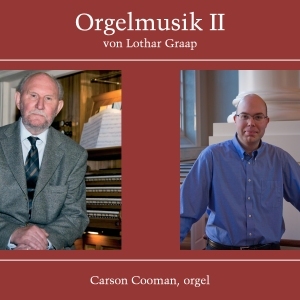 Carson Cooman has another volume of organ works out now on Divine Art. Man Forever’s Play What They Want is out now on Thrill Jockey. Last weekend in Tanglewood, we saw the Nashville Symphony’s conductor Giancarlo Guerrero beat the Boston Symphony in a thrilling version of Stravinsky’s Rite of Spring. Kiasmos’s Blurred EP will be out in October on Erased Tapes. Sad I missed Quatuor Bozzini’s August New York performances (Tanglewood two-body problem), but was glad to be kept up to speed by Steve Smith in the Log Journal. Sequenza 21: The latest CD of your compositions, Liminal on Divine Art, features three works, a short orchestra piece, Shoreline Rune, Liminal, your Fourth Symphony, and Prism, an older work for organ. How did you decide on this grouping? Carson Cooman: A number of recordings of my music have been released, and the music on them has been grouped and organized in different ways, depending on the repertoire at hand. For this release, I wanted to try a “mini-album” (shorter length than a full CD and priced accordingly). So the symphony was the main affair, and then I chose two other pieces that would serve as a sort of prelude and postlude. I remember Lutoslawski said that he settled on his characteristic large scale form (short introductory movement followed by a main movement) because he felt there was too much information to digest for a typical listener in a traditional four movement symphonic structure. In a somewhat related way, I wanted to do an album where instead of lots of pieces competing to fill up the 80 minutes of time there was just one main piece and then two shorter pieces to take the listener in and out of it. I was grateful that Divine Art was open to doing this. Shoreline Rune was written as a birthday gift for Judith Weir, and then Prism was an organ piece from more than 10 years earlier, which I chose simply because I felt its mood worked as a postlude to the symphony. S21: Judith Weir is the dedicatee for Shoreline Rune. How do you know Weir and which of her pieces would you recommend to listeners to get to know her work? CC: I studied with Judith Weir for a year in college, and it was a remarkable and inspiring experience. While I had quite positive interactions in different ways with other teachers, I’ve often felt that I gained more in that short time with her than I did in all the other years of formal study combined. For my taste, you can’t really go wrong with digging into her output. And like so many British composers, she has pieces for all purposes: from major concert works for the world’s best orchestras to easy pieces for amateur congregational singers. This versatility of purpose is something I greatly admire and strive for myself, and for various reasons, it’s been far more common in the 20th/21st century in UK composers than in other countries. But in terms of a few specific Weir pieces that are personal favorites: Her first big opera, A Night at the Chinese Opera, is a masterwork. The orchestra piece The Welcome Arrival of Rain is quite moving. And there are so many exceptional chamber works: I Broke Off a Golden Branch and the Piano Concerto being two personal favorites. Chamber music is a particularly good fit for her sensitive, transparently luminous musical aesthetic. S21: Your Fourth Symphony is about climate change. What made you decide to respond to this global issue in symphonic form? Are you feeling either Adams breathing over your shoulder? CC: I use the term symphony simply to imply that a piece is inspired by a “big subject.” Thus, the five pieces (four for orchestra and one for organ solo) that I’ve given that title all have different big topic inspirations. However, I really don’t see these pieces as “grand statements” that try and sum anything up—and certainly not in any truly cosmic way. They are much more akin to writing a personal essay (or a long Facebook post! ), just reflecting and expressing in some way my own thoughts. And, in some ways, writing the pieces on those subjects (whether or not one believes music can express anything concrete) is just a way to help me organize and work out what I think. I get itchy around “grand statements,” which in the right hands can be remarkable experiences, but the arrogance of which they often smack personally doesn’t sit well with me. My decision to use climate change as the inspiration for the symphony came simply after several years of thinking, reading, and personal processing about the issue. Certainly when writing any environmentally connected piece of music today, John Luther Adams’s presence is inevitable. I think it’s wonderful that in spite of its “experimental” roots, his work has in the last few years really entered the classical mainstream. I think what my pieces do and how they are put together are rather different from JLA, and while my piece does also have a climate/environmental inspiration, it’s a different work than Become Ocean is, for example. As for the other Adams (John Coolidge), I’ve also heard everything he’s written, and there are many pieces that I greatly enjoy as a listener, but I don’t think much from his style has had an audibly direct impact on what I write. I think partially it’s because his most characteristic devices are now so instantly recognizable as his. I hear those influences very audibly in a number of composers today, and that’s totally fine—in a sense they are working in their own way in a new post-John Adams tradition. But just as a personal choice, I don’t want to use his devices so directly. S21: Organist Erik Simmons has been one of your staunchest advocates. How did you come to work with Erik and what is it like writing for another organist? CC: I’ve been very fortunate that my organ music has been well-received and played by many fine organists, but Erik has taken to it to a degree that goes above and beyond. He’s recorded four full CDs of my organ pieces so far, with several more in the works, including a double disc set of all my organ pieces inspired by pre-baroque genres. It’s not officially a “complete organ works” project, though in the end it will probably be close to that. In my own organ performing, from time to time I’ve had this experience myself where I almost compulsively want to play and record as much as possible by a particular composer. Erik’s work with my organ music has been a bit like that, and I’m just experiencing it now from the other direction, which is very flattering. Our work together has also generated a number of new compositions, all of which he has recorded beautifully. In terms of “writing for another organist,” that is always what I’ve done. None of my organ music is written for myself. I never play my own pieces, unless somebody specifically asks me to do it. The main reason is that, as a player, I enjoy most the sense of discovery and exploration of repertoire, and I already “know too much” about my own music, having spent lots of time writing it in the first place. Composition and performance are two different impulses for me, and I get different kinds of satisfaction out of them. S21: Your own activities as an organist have included a considerable amount of commissioning, performing, and recording. Tell us about your most recent recording projects as a performer. CC: Relating to what I said above about a kind of compulsive obsession, much of my recording activity the last few years has been devoted to the work of several composers: Thomas Åberg (Sweden), Carlotta Ferrari (Italy), and Lothar Graap (Germany). In all three cases, I’ve recorded CDs and also a large number of additional works for online/YouTube. Lothar Graap has been the focus in 2015. Born in 1933, Graap spent most of his life in the former East Germany (DDR), and because of that, his work was not widely known outside until the 1990s. Several pieces were published internationally by the state publisher in those decades, including his Meditationen (Meditations) (1968), which I think is one of the true organ masterworks from those years of East Germany. Since 1990, Graap has published old and new pieces with many publishers in Germany, and his work is now widely used within that country. However, it is still little known in the USA, and my recording project was conceived partially to address that. I really like his music; its very German aesthetic is appealing to me, since a French influence has become all-consuming and pervasive in 20th/21st century new organ music (in all countries, including the USA). There isn’t a French moment in Graap’s music, and I thus enjoy working with something that is different from so much of what one usually hears today in new organ literature. As a fine organist himself, Graap writes music that is beautifully conceived for the instrument; much of it is very well suited to the small and medium size organs that are my personal favorite kinds of instruments. Much as I enjoy hearing the whole spectrum of organ music in the hands of other players, my own personal tastes tend to gravitate towards organ music with a strong neo-baroque aesthetic, but re-imagined through the lens of the present era. Much of my recording activity in 2015 has been devoted to Graap’s work. This summer, I released two CDs of his music and have also recorded some 75 additional works online. There are a still a number more that I want to do before I’m done with this project. Since we’ve begun this project, he’s also written a few new pieces for me which I’ll premiere in 2016. In addition to those three composers, I’ve also (in smaller quantities) continued to perform and record works by many other contemporary composers as well. At last count, I’ve recorded organ works of more than 225 different contemporary composers since 2012. As the organ editor for Lorenz Publishing Company, I am also simultaneously developing and commissioning new organ publications from many composers, covering the entire spectrum of organ literature: from pieces for part-time church organists to recital literature. S21: You are an uncommonly prolific composer. My composition students often ask me how forebears such as Bach or Handel wrote so much music. While writing in many genres and styles, how does a composer in the Twenty-first century find their voice? CC: Since the late 19th century, a romantic/post-romantic paradigm seems to have become the norm in terms of how one conceptualizes an output and body of work. This even true for people whose music has absolutely nothing whatsoever to do with romanticism as an aesthetic or style. But the notion that one writes primarily big pieces (and fairly few of them) is something that has stuck with us in contemporary concert music circles. I think it’s this inheritance that makes it hard for many composers to think about the kind of productivity that was the norm in earlier eras (and not unheard-of from certain composers in the early 20th century either). My own thinking is in many ways more like that of pre-romantic eras. I’m a professional composer, and so I write music to the best of my ability when I’m asked to do so: whether that be for professional orchestra or amateur chorus. The “great artist” ego has little appeal to me. I’ve always been relatively prolific, and I’ve found in my own experience (and with many of my friends and colleagues) that we all have different paces at which we work, and trying to change that pace is not going to be effective. You simply have to find your own musical metabolism and learn to produce the best work you can that way. No actual teacher of mine tried to make me write less, but when I was a student other people advised it, based on their own (slower) pace. There was nothing to be gained by that, however, as it simply wasn’t the way that I worked. It ultimately made no more sense than it would make for me to try and force somebody who writes really slowly to produce a lot more just for the sake of doing so. But of course, I can’t escape that post-romantic aesthetic inheritance entirely. For example, I do make a conscious effort not to repeat myself and not to accept commissions/projects where I think the result might be just be a lesser version of something I’ve already done. Because I was born in 1982, I worry about things like that. If I had been born in 1682, such thoughts would not have crossed my mind! When people criticize Vivaldi (not really true, of course) for writing the “same concerto over and over again,” the notion that doing something like that would have been somehow “wrong” would have been rather foreign to him. But because I live when I do, I can’t escape entirely the milieu and aesthetic in which I came of age musically. In the end, I just try and do the best work that I possibly can in the manner that has come to be my way of doing things. Each person needs to find for themselves what that method and pace is. 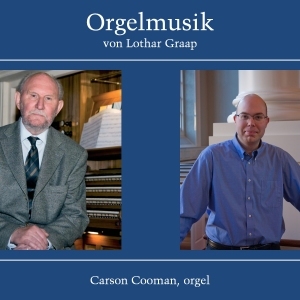 My colleague and friend Carson Cooman has become a steadfast advocate of composer Lothar Graap, recently releasing two CDs of his organ music. Listen below. Performed at Memorial Church, Harvard University, November 24, 2015 by the Harvard Choral Fellows, directed by Carson Cooman. On November 24th at 8:45 AM, Carson Cooman will be playing a chapel service consisting entirely of my music at Appleton Chapel of Memorial Church at Harvard University. In addition to performing the solo organ piece “Chanson Variations,” he will be joined by the Harvard Choral Fellows to premiere my Psalm 103 anthem and the hymn setting Add One More Seat. The latter piece I wrote with my wife Kay Mitchell. We have dedicated it to our Pastor Jeffrey William Mays, who is retiring after many years of service at Christ Congregation in Princeton. I know it is a bit on the early side, but I would love to see some of my Boston friends there if you can make it.